Uber-cosmopolitan New York City may seem the ultimate interconnected melting pot, yet local communities can be very powerful in its midst. Disturbingly so, if they turn out to be closeted, oppressive and non-inclusive. 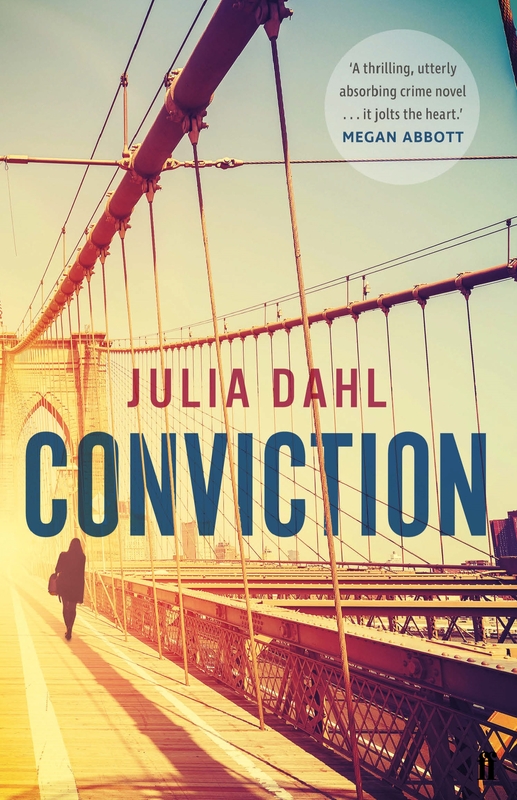 You’ll get a strong sense of this reading the powerful crime novels written by Julia Dahl, featuring young New York journalist Rebekah Roberts, of which ‘Conviction’ is the third so far. Julia Dahl is herself a journalist, specialised in crime and criminal justice. 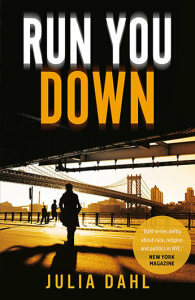 Her first Rebekah Roberts novel, ‘Invisible City’, published in 2014, won the Macavity, Barry and Shamus Awards, and the second novel in the series, ‘Run You Down’, was published in 2016. ‘Conviction’ shines an unflinching light on some of the tough social issues that are Dahl’s – and Rebekah’s – hallmark. A miscarriage of justice, after sloppy work by the NYPD and the local judicial system, both biased against a young African-American man. The drawbacks of closely knit communities that become militant and cause damage both within and without them. And, at the bottom of it all, human weakness in its many guises, leading to tragically wrong choices compounded by the inability, through ignorance, laziness or both, to make things right again. Rebekah Roberts is keen and resourceful. She’s not having the time of her life, professionally or personally, but she’s giving it a fair go. After two years as a stringer for the New York Tribune (the Trib) – a tabloid hungry for breaking news rather than the more insightful pieces Rebekah likes to write – she has just been passed over for a feature writer job. As the story starts, Rebekah is back on the freelance treadmill. She’s an appealing if underachieving heroine, who carries heavy family-related baggage (an estranged mother who left her and her father when she was very young) and yet tries to get on with it as cheerfully as possible. More or less by chance she hooks up with mother-of-three Amanda, based not far from Brooklyn’s Gowanus neighbourhood where Rebekah lives. Amanda runs Homicide Blog, a website which keeps track of every murder in New York City as a way to raise awareness against violent crime. She often receives mail from convicts claiming they have been wrongly incarcerated, and is willing to pass some of it on to Rebekah, as it could be the hook the journalist needs for a story she wants to pitch to an organisation fighting miscarriages of justice. Perhaps not the most gripping crime novel opener, but Dahl’s incisive writing and her relish in portraying gritty, yet endearingly loopy Rebekah makes it all come alive. Amanda puts Rebekah in touch with an African-American man, DeShawn Perkins, who has been in jail for twenty years for the horrific murder of Sabrina, Malcom and Kenya Davis, his foster parents and young foster sister. DeShawn claims he was wrongly charged and sentenced, the police extracting a confession from him unorthodoxly, never following up any other leads, and dealing shoddily with the highly dubious and only witness the prosecution had. The judge ruthlessly ground DeShawn through the system, giving him token lawyer representation and a hurried trial, and his youth just blew by in jail. What nails it for Rebekah is that one of the NYPD officers who arrested DeShawn is a Jewish man she knows well, Saul Katz, who has now left the NYPD in disgrace and is living with Rebekah’s mother Aviva. It’s hard not to take sides in the NYC Legal System vs DeShawn Perkins match, as uneven a contest as you’re likely to find. DeShawn never had any luck even before the murder of his foster family. He was born to an unknown father and drug-addict mother, and went into fostering from an early age. Arrested for shoplifting and released, at 16 (at the time of the murders) he was entering problematic young adulthood. Can an ‘ordinary’ journalist set things right for him? Will Rebekah be able to make inroads into a 20-year-old case, in which the police were all too willing to believe the only witness that turned up to accuse DeShawn, unreliable prostitute Henrietta? What role will Saul Katz play? He too has had tough breaks in life. He tried to escape the ultra-orthodox Jewish community in which he was born, joined the police but, despite his best intentions, was something of a failure on all fronts, fired by the NYPD after he beat up a man who had sexually abused his only son Binyamin, after Saul and his wife divorced. What makes Dahl’s novel fascinating is her ability in portraying the less privileged denizens of not so affluent, benevolent or understanding New York City. No one is perfect and nowhere is a perfect place to live, but the contrast between privilege and lack of is starkly rendered in ‘Conviction’. As is that between the African-American and Jewish communities uneasily, often violently rubbing shoulders with each other in Brooklyn. The plot is steeped in dramas large and small, and in an atmosphere of bleak America – all the more painful as we’re in Brooklyn, not some remote post-industrial backwater – making the misery wrenching at times. Dahl writes with a spare, almost deadpan yet powerful style, shying away from over-dramatizing, and making it all even closer to the heart and the gut. She is in her element in portraying the relationship between two troubled communities, especially the ultra-orthodox Hasidic Jews who featured prominently in her first two novels. And while the devoutly Christian friends of the Davis family were too disorganised or uncaring to stand up for DeShawn’s rights, the Jewish community is shown to be equally at fault for its exploitation of the Brooklyn blacks, and for its insularity and the ‘us vs them’ culture some of its members fostered. The plot is well-structured and Dahl handles the backwards and forwards in time well, taking the reader from 1992, when the murders for which DeShawn was arrested took place, to the present. From a purely whodunnit point of view however, I found it less satisfying than Dahl’s earlier Rebekah Roberts novels. I may be old-fashioned, but I like a well-concealed perpetrator, something which is not really what Dahl treats her readers to in ‘Conviction’. Dahl’s first novel, ‘Invisible City’, also felt a little closer to her heart in the powerful rendering of life within and without the Hasidic community in New York. Perhaps the fact that Rebekah is somewhat clutching at straws professionally in ‘Conviction’ makes her side of the story less intense. It’s always difficult for series authors to make their characters grow over time though, as the features that make them attractive, as with everything in life, cannot remain fixed. I found the early Rebekah, greener, still in denial about her mother and determined to make her mark at the Trib, a touch more appealing than her slightly older self. On the other hand, full credit to Dahl for allowing her heroine to develop, and for not crystallising her in a formulaic persona, always keeping her intensely real and working subtly to make her an engaging character. 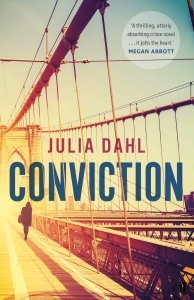 Besides, ‘Conviction’ is a very good read also because Dahl is truly gifted at transporting her readers into worlds that can be so near to our experience and yet, tragically sometimes, so far. And this is what makes good fiction, crime or otherwise, a pleasure to read.